At the recent CoreNet Global Summit in Singapore, attendees learned that having informed and highly accurate information powered by technology takes your strategic decision making to the next level. The “Taking the Lead with Mobile Surveys and Workplace Tracking” session identified ways to utilize new, innovative technology and empower your employees to be more mobile, agile and productive. Participants learned the benefits of tracking how the workplace (space) is working at any point in time and discovered how mobile space surveys and workplace tracking technology can reduce an organization’s carbon footprint, drive strategy, add value, increase ROI and create proof points. Are you able to track how the workplace is working at any point in time? Do you have information needed to identify opportunities and swiftly act upon them? Learn what Summit attendees now know about how Standard Chartered Group is using tools to enable access to data to create and foster collaboration with stakeholders. 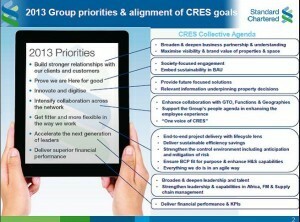 Then, you too can help ensure that the CRE function stays relevant acting as a change champions. The presentation is available for free for 30 days post-Summit. If you’d like to view the presentation after this timeframe, please click here. Please share any experiences you have using mobile surveys and workplace tracking in the comments below.